The Tool Holder secures gouges from 1/4" to 3/4" diameter for grinding. A special bearing locks the tool when the knob is tightened. The angle of the tool is adjusted on the side of the holder and locked with an allen wrench (provided). 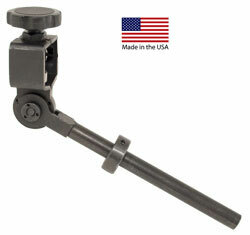 The shank of the Tool Holder fits into the hole on the Sliding Arm and is positioned by an adjustable stop collar. A measuring device is attached to the side of the Tool Holder to ensure the tool protrudes from the holder the correct distance. Extra tool holders can be pre-set for different tools.